A rainforest is one of the most intriguing locations on the earth. Their density, tangled jungle vines and uniquely adapted wildlife invoke curiosity and appeal to the imagination in children and adults alike. Rainforests are normally divided in five identifiable zones referred to as layers or life zones. The lowest level resides at the ground, in the Herb Layer. This layer consists mainly of saplings, ferns and tree trunks. Although slim shafts of sunlight may reach down this far, this layer seldom sees light. Small ground-dwelling birds called pittas live at the layer, avoiding other life as much as possible. The soil itself can not produce many plants. Unlike the ground floor of an ordinary forest, covered with leaves and castoff material from the trees, the rain forest floor is beset by tiny scavengers that immediately consume what dead organisms are able to drop through jungle growth to the ground. Slightly higher is the Shrub Layer of the rainforest, above the ground from approximately two to twenty feet. Here you’ll find vines, and unique trees referred to as “cauliflorous”, which means they grow clumps of flowers directly from the tree trunks. The shapes of the flower clumps do indeed look somewhat like cauliflower. Larger animals such as tapirs can get through the shrub layer quite efficiently. Standing in the rainforest and looking up twenty to forty feet, you see the Understory Layer. This layer, along with the lower ones, is where you will see small birds feeding. It is so dense with foliage that most creatures can not move through it. There may be opossums at this layer in South American rainforests, or bush babies in the African area. This is because these creatures have adapted to the slippery branches with their grasp and prehensile tail, respectively. The much taller Canopy Layer is teeming with life. Macaws, toucans, and bright birds of the parrot family reside there, and so do climbing animals like monkeys and sloths. There are a multitude of vines and bromeliads growing on the vines and trees that can withstand perching and swinging up to a weight of several tons to a single branch. 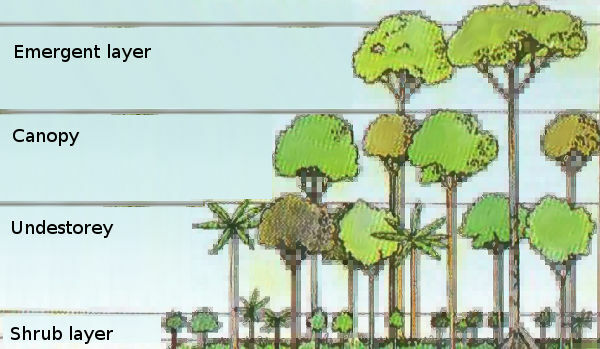 The highest layer in the rainforest, made up of the newest growth, is called the Emergent Layer. This is a prime location of birds of prey to look for quarry, some of them eagles with the ability to capture monkeys. This layer, of course, is highly exposed to the elements, so most animals will gravitate instead between the Canopy and Understory. A person may find it astonishingly easy to walk through the two lower layers of the rainforest, look around, up, and enjoy observing the unique wildlife and jungle growth. If you are lucky enough to have this experience, surely you will find it one of the most intriguing adventures ever taken. Man’s most gruesome, unimaginable atrocities have been well-documented in the pages of history, albeit for reasons relating to the abatement of personal interest and curiosity than genuine human compassion. Civil wars and genocides all but wipe select racial groups from the planet permanently, but it is the psychological reasoning and twisted thought processes of those hardened souls brandishing the weaponry which sparks intrigue in the minds of onlookers. The actions and horrors themselves do not interest people so much as the story, the drama of the events taking place; to look at horror in retrospect and through the filter of dramatics is a way to detach oneself, to cast off self-blame, because it is much more pleasant for one to ponder “what if” instead of “why not” when thinking of an event which occurred under their nose-“If I were there, I would have…” And as the world so casually goes about its day, a genocide of sorts is occurring as this very moment: the rapid deforestation of the Amazon rainforest in Brazil, where over 25,000 square kilometers of rainforest are being destroyed each year. The practice of deforestation in the Amazon, particularly of valuable hardwoods began practically and innocently, however. In the 1950s and 60s, the state of Pardi (located in the island region of the Amazon delta) was the hub of the Amazonian wood industry, and due to its remote location, it worked to produce only exports as it held no reliable connection to the large urban markets of southeastern Brazil. But as a series of highways were constructed in the late 1970s and early 1980s, accessibility to the region increased, making it easier to import workers and more efficient logging machinery to the region and also helped make it cheaper and more profitable to export product to the now reachable urban Brazilian markets. And as cheap laborers replaced indigenous peoples, as cattle replaced wildlife, as machines replaced axes, as trucks replaced boats, production increased and set in motion a reality of monumental environmental destruction that has continued through the present day. Today, the Amazon rainforest is being destroyed mercilessly. As logging and cattle ranching proceed with little opposition from government forces (in some cases, the desperate actions of the local indigenous populations prove only resistance), the over 25,000 square kilometers destroyed each year in the Amazon is nearly double the mid-1990s rate, proof that the problem is growing exponentially worse. And as the sides of roads are dominated by new slaughterhouses and meat packing plants, the Amazonian states of Rondénia, Paré and Mato Grosso have seen the biggest increase in cattle herd size and, not surprisingly, the most rapid rate of deforestation-a correlation which undeniably implicates the institution of cattle ranching as a primary culprit in the deforestation dilemma. The Brazilian government, however, has taken some action in attempting to control the rate of deforestation in the Amazon. During the eighth United Nations conference on biodiversity in Curitiba, Brazil, President Lula (Luiz Inácio Lula da Silva)’s Brazilian government announced that it will now protect almost 800,000 km2 of Amazonian forest, a nice step toward controlling the total eradication of the Amazon but well short of any significant goal in sustaining the forest’s profitability while also keeping the Amazon environmentally sound. And just this year, the journal Science published the work of two scientists who, through the use of ultra-high-resolution cameras, discovered that the area of rainforest destroyed between 1999 and 2002 is in reality at least 60 per cent greater than what was estimated, an alarming find which proves that the Amazon is being destroyed at an even more alarming rate than previously thought. Will the Brazilian government under the progressive Lula serve the economic interests of the people at the expense of the Amazon rainforest, or will they take an economic hit and put an end to the deforestation which plagues the region? The heart of the government’s decision is this: is it more important that Brazilians have employment, or is it more important that the world’s largest rainforest be protected? The answer, of course, lies somewhere between the two poles but, for many in a nation who holds the largest debt in the developing world, sustaining a rainforest undoubtedly seems less important than putting food on the table. A compromise must be made.